The girls enjoyed sitting together in the sled taking rides around the yard and up and down the street. Julia would sit stiffly and look around while Emily giggled and held Julia steady (most of the time). The best ride was on the road, but required a lot of parent effort to make it happen. 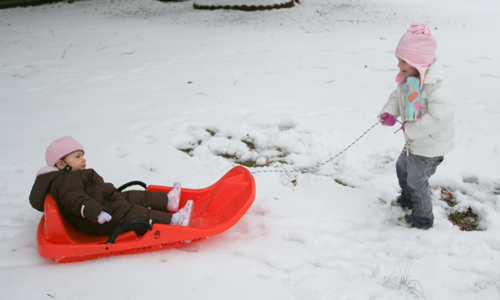 Emily was also very interested in taking Julia for a ride in the sled. Luckily the sled never took off with Julia.